By what metric shall we measure a story—any story—and, in this case, a movie? In part, I believe it is any creation's capacity to elicit an authentic feeling and, more fully—particularly with film—its capacity to create an alternate reality for a few minutes or, ideally, for a couple solid hours. By that metric, Jackie crosses the finish line. And yet it is hamstrung by three ghosts in the machine: antagonism, a bit of overacting, and audio. Billy Crudup's character, a journalist interviewing Mrs. Kennedy not long after the funeral, is unnecessarily antagonistic. He bates and demeans Natalie Portman's character in a way that I find false, and it is distracting from the momentum we might otherwise feel early in the film. Auditorily, the film is saturated in a bleak, depressing score by Mica Levi. I understand and appreciate that the music is intended to be unsettling, foreboding, disturbing, and on those counts it succeeds wildly! But it is so oppressive, so claustrophobically unpleasant (think James Wan violins and flutes!) that it makes enjoying the film an unnecessarily arduous task, like looking at a Monet whilst someone drags her nails down a chalkboard. The cinematography, however, is lush, rich, deep, and gorgeous from the get-go. It has a Kodak vibe (like The Wonder Years) that is equally gritty, warm, and inviting. The assassination, the First Lady's bloodstained clothing, the interview that serves as the film's organizing principle, the funeral planning recounted throughout said interview, brief musical interludes featuring Richard Burton and the cast of Camelot, Kennedy's place in history, the grievous loss of a virile young president/husband/father/brother/son, the hollowed-out blackness that insidiously creeps through the lives of two innocent children, the powerful emotions that one experiences as Jackie climbs higher and higher in muddy heels up Arlington National Cemetery to plant a stake marking the spot that will become The John F. Kennedy Eternal Flame, his interred coffin flanked on either side by tinier coffins of Arabella and Patrick (his two children who preceded him in death). These moments are quiet, solemn marvels in filmmaking. The scene portraying Secret Service agent Clint Hill (who immediately leapt onto the trunk of the car and shielded Jackie en route to Parkland Memorial Hospital), the scene in which Jackie showers and blood flows down her back, and the scene in which we see the Eternal Flame conceived were—for me—each, alone, worth the price of admission, and certainly reasons enough to endure the abominable soundtrack. 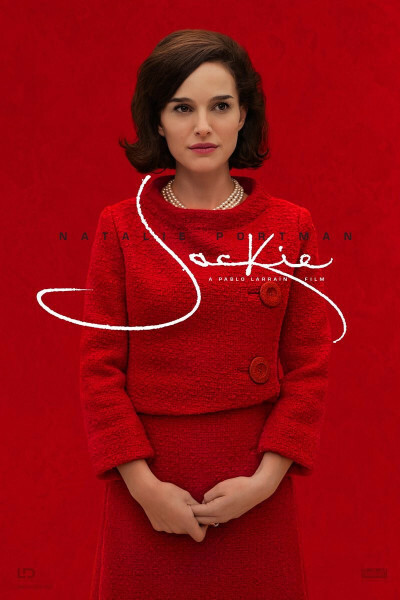 If the score had been as beautiful as everything surrounding it (imagine A Beautiful Mind, The Prince of Tides, or virtually anything by late greats James Horner or John Williams), Jackie would rank among my favorite films of 2016, because Natalie eventually does convince me she is Jackie, and I am transported—for perhaps 2/3rds of the film—believing that I am in the White House, that I am with Jackie in Hyannis Port, that Natalie has channeled—more authentically than I first gave credit—one Jacqueline Lee Bouvier Kennedy. I now consider Portman's metamorphosis worthy of an Oscar nomination on January 24th, and will be curious to see if others agree when that bright day comes.